If there is one that I do love, which is leftover Halloween candy! Sometimes you just have to much candy leftover that you do not know what to do with it. You start to get sick and tired of just eating it because you do not want to waste it, instead, you should cook with it! Don’t these look absolutely scrumptious? 🙂 Below you will find 21 different ways to use up your leftover Halloween candy! Yep, I said that right – 21 ways! Which ones are you going to make? Your Butterfinger Fudge looks SO GOOD!!! Awesome list of recipes! It is actually way too good LOL! Thanks for stopping by, Jen! 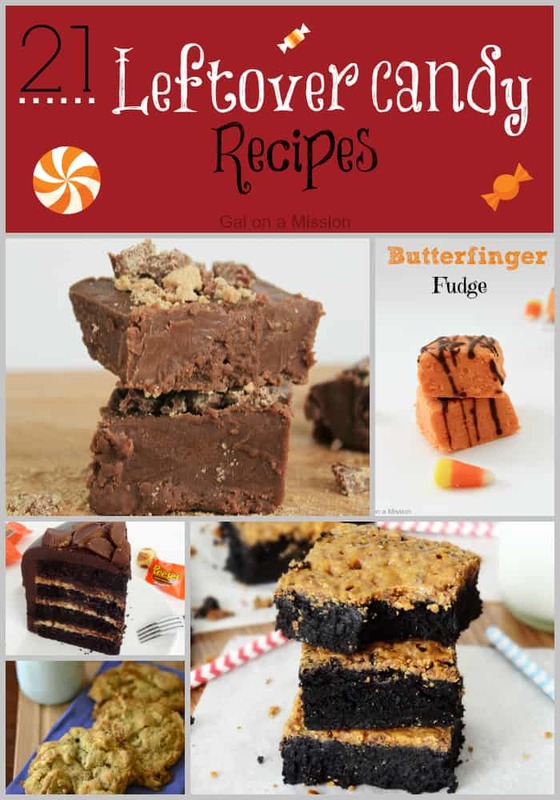 What a great collection of candy recipes, just in time for the holidays! Hope you are having a great day and thank you so much for sharing with Full Plate Thursday! You must know that I have a stash of chocolate bars that I steal from every time I walk up the stairs. Thanks for sharing on the weekend re-Treat link party! Great collection of candy recipes. We have way too much leftover candy from Halloween! I will be trying the Reese’s Fudge for sure! Hopping over from Flamingo Toes. Rolo Peanut Butter cookies would be one of my favorites. Great list of leftover goodies! Thanks for sharing with SYC.